I have lived in Texas almost 40 years. It’s one of the few places you hear of people going to their “ranch” on the weekend or for a vacation. I always wanted a ranch. In Mexico, people name their homes or property. I always wanted a home with a name. So when we found our dream property in Bacalar, Mexico, I immediately began searching my imagination for the perfect name for our future home. Rancho Paradiso (Paradise Ranch), the perfect blend of Tejas y Mexico. 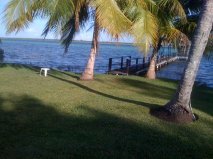 Of course the first time we walked the half acre on beautiful Laguna de Bacalar, we didn’t realize that, “this was it”. 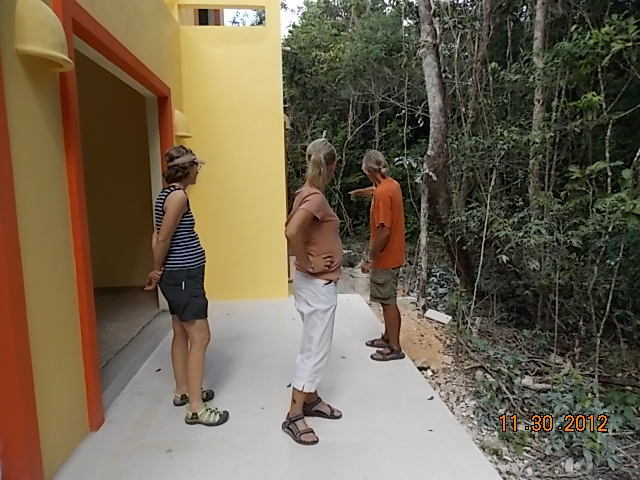 Visiting the property of a fellow ex-pat (Canadian) and seeing the layout of his home and gardens gave us the vision of what we could accomplish and thus created la idea of Rancho Paradiso. My inexperienced videography doesn’t exactly show off the property in it’s best light. It’s a narrow, sloping, lake property that will need terracing. We will build a small house with lots of outdoor living and a star-gazing roof. I have hand drawn plans that are similar to the ones I was drawing at 21 when I lived in Cholula, MX. We have miles to go before we get to the building phase but for now, it’s fun to troll pintrest looking for gardening and decorating ideas. Stay tuned. The lawn slopping down to the laguna. After months of suenos of Bacalar, Mexico, Lisa and I were finally on our way. We had flown into Cancun and traveled to Tulum to visit the town, pyramids and our friends Karen and Skip. I think I held my breath all the way from Tulum to Bacalar. What if it wasn’t what we wanted? What then? The highway was smooth which made travel rapido y comoda. It was two lanes with wide shoulders (perfect for cycling), with an occasional exit for somewhere else, a few casitas and mostly long stretches of thick jungle. What I found out later was that the highway passed through Sian Ka’an, a million acres of a biosphere reserve, i.e. protected wetlands, tropical forests, mangroves, and home to over 300 species of birds and wild monkeys. It borders on the Caribbean and has only five entradas. Sian Ka’an is Mayan for ‘Origin of the Sky’. This amazing ecological wonder is within dos horas de Bacalar and literally in our back yard and is available for camping, kayaking, birding and many other activities. As our bus chugged along, I kept watching for a glimpse of the lake. I knew we had to be getting close and I wanted badly to see if it was as beautiful as I hoped. FINALLY, off in the trees, aqua azul! I was confused when the bus driver announced almost immediately, “Bacalar”. I thought I’d misunderstood. The lake is 55 km long; surely we couldn’t be there already! But we were. The lake is not visible from the highway, and one could miss it if they didn’t glance to their left as you pass through town. We gathered our luggage and found a taxi to our destination, Casita Carolina. This was one of the first times we’d made reservations while traveling, usually we lean toward spontaneity. As we got off the bus, Lisa and I looked at each other and grinned from ear to ear. This felt like our new home. Bienvenidos a Bacalar. 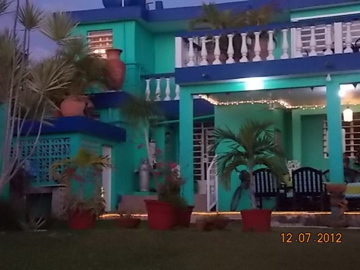 Casita Carolina – the website is filled with information about Bacalar. The common area where travelers access the computer and visit. 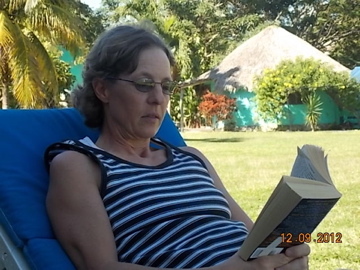 Lisa relaxing in the shade at Casita Carolina. In summer 2012 it became clear that I could be available to retire from my state job in 2013. After a conversation with the retirement office and a purchase of back service, I determined that a retirement date of July 31, 2013 was possible. The annuity would be small and living in Austin with it’s increasing taxes would be challenging to say the least. With Lisa’s help we created a plan. With my small annuity and her VA disability check, just maybe we could afford to retire and travel as we’ve always dreamed. The search for a retirement location was narrowing and everything pointed to Bacalar in southern Yucatan. It was time for a visit to see el pueblo for ourselves. 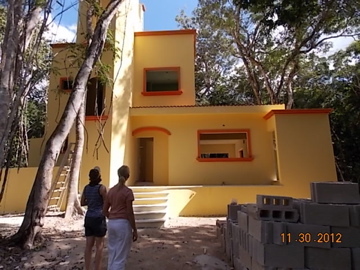 The trip would also be an opportunity to stop in Tulum on the way to Bacalar to visit my friend Karen and see her house. We planned the trip for the first two weeks in December and made arrangements to fly into Cancun. We left on a Friday and arrived among the beach vacation and bachelor-party crowd, already in flip-flops and ready to soak up the sun (them not us). I stopped at the kiosk in the airport for ADO (ah-day-OH) bus line and got our tickets to Tulum. Buses in Mexico are clean and comfortable. 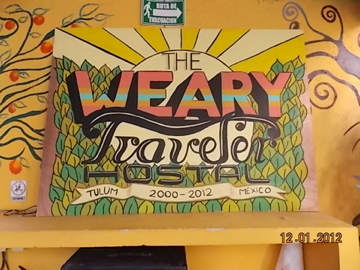 We arrived easily and found the Weary Traveler Hostel not far from the bus terminal. Hostels can be a fun way to connect with other travelers in a laid back environment. For about $30 a night, we had a basic room, communal kitchen, breakfast and a free bus ride to the beach. We spent the weekend exploring the pyramids, visiting Karen and Skip’s house and hanging out on the beach. Come Monday morning, we were ready to put Tulum behind us and head off to Bacalar. ADO is a government supplemented transportation company that offers extensive and efficient transportation services. 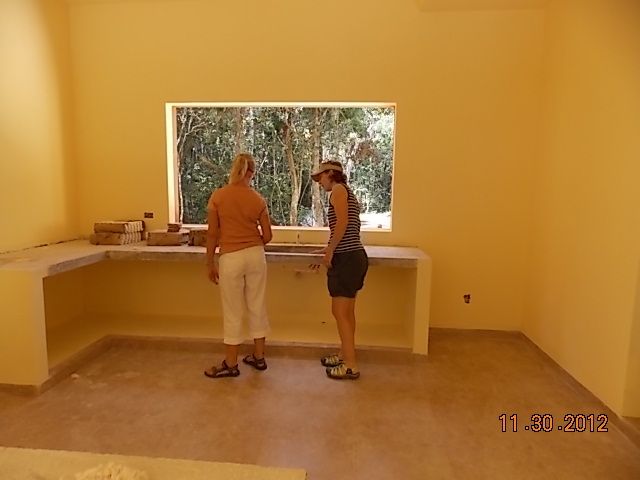 Karen & Skip’s beautiful home on five acres in the jungle is waiting for their solar panels.